I was in Singapore a few weeks back for a short break. Unlike my sisters, I wasn’t interested in shopping. 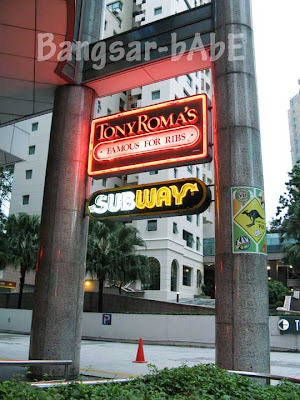 Instead, I wanted to try Tony Roma’s because they serve PORK. 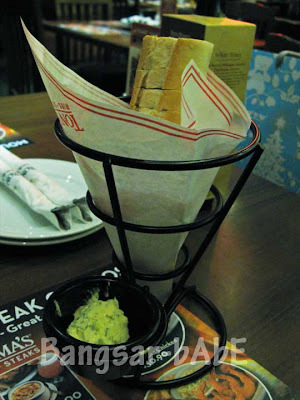 rif and I went to the branch in Orchard Road because it’s nearer to our hotel. I ordered what I came for. 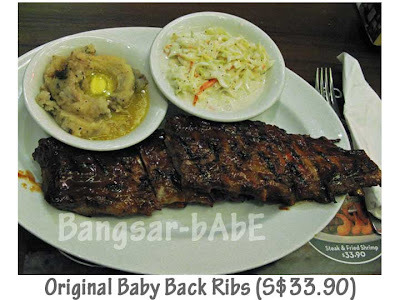 A full slab of original baby back ribs. For sides, I chose coleslaw and mash potatoes. rif had the Sirloin Cheddar Grille Sandwich. We started off with some bread and garlic butter spread. I reckon the butter was unsalted, it was bland tasting. 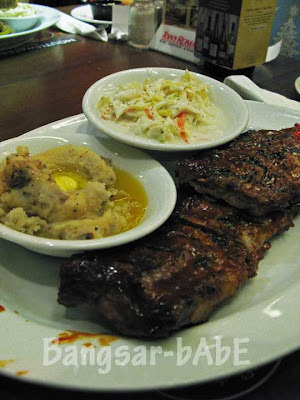 The pork ribs were juicy, tender and falling off the bone. The ribs were marinated in a smokey, honey-based sauce. Slightly sweetish and very tasty. There were 16 slabs altogether, and I shared half with rif. The mash potato was quite good. This version had little bits of potato skin, black pepper and some butter in the center for extra richness. The sirloin sandwich was pretty good. 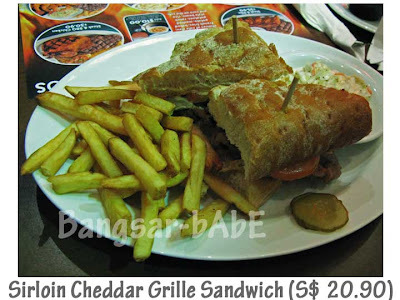 The beef slices were tender and well grilled, and the melted cheddar gave it a richer, more satisfying bite. The fries were standard, nothing to shout about. All in, the ribs were good, but not fantastic. I guess my expectations were too high. Service was mediocre. They didn’t give us any chilli or tomato ketchup for the fries. They just placed the food on the table and left. The bill came up to S$64.50 inclusive of 10% service charge and 7% tax. Verdict: In general, the food is nicer than TR in Malaysia, but I found their service lacking. Then again, service in TR Malaysia isn’t fantastic either.